This is the traditional segment of the sports shoe market. These consumers are actively involved in fitness or sports on a regular basis. They are usually looking for a good quality sports shoe that has the performance required to support them in their chosen field of activity. Many of these consumers would go to the gym or some form of fitness class on a regular basis or participate in some form of organized sport. They are most interested in well-known brands that offer higher quality shoes. They are willing to pay a higher price (within reason) for a suitable product. Consumers in this particular market segment are highly committed to a particular sport, and probably train more than 10 hours per week. Some may be professional athletes, but the majority are serious competitors in their chosen sport. They are particularly interested in shoes that are designed for a particular function (such as running, cycling, basketball, and so on) and typically seek out more modern innovations and technologically-advanced products. This will be a high involvement purchase decision for these consumers and will tend to be relatively brand loyal as a result. It is a very mainstream market. It consists of a wide variety of people who are looking to purchase sports shoes to wear on day to day lifestyle basis. Because they do not wear the shoes for any specific sporting purpose, they are less concerned with the actual quality and performance specifications. They are most interested in comfortable shoes that represent good value for money. They tend to be quite attracted to very well-known brands because they consider that to be a safe, low risk choice. This is an emerging segment that is looking for sporty looking fashion shoe. 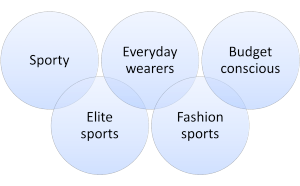 They do NOT buy the product for its sports function, but for its style, look and brand image (for their social/self identity). 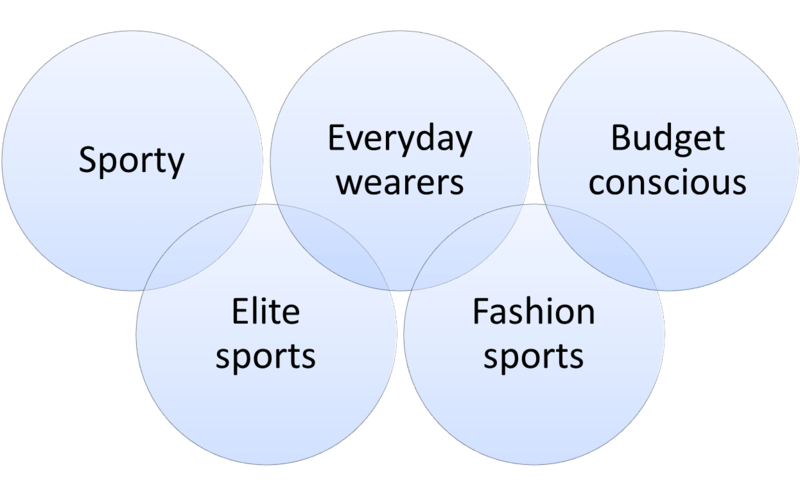 As this market tends to be teenagers, young adults and young professionals, they want brands that are unique to themselves, not brands that their parents wear. Like any market there are a proportion of people who are very budget conscious, or will buy cheaper shoes on occasions. These consumers are after low quality, low priced shoes that have a sporting look about them. Consumers in this market tend to be families, retirees, or consumers looking for an extra pair of shoes simply to wear around the house or in the garden.